Route: Goathland, Whitby to Gaydon, Warwickshire. Well here is the last news report of our epic historical journey! We were finely hosted in The Goathland Hotel alias The Aidensfield Inn where we held our 1960s revival evening to celebrate 50 years of our fantastic cars that have carried us in excess of 2000 miles since we left our homes. Our French and German cousins have yet to do another LEJOG just to get home! Our 1960s evening was a tremendous success with the ladies reviving the mini dress and the gentlemen wigging up and dressing in as Heartbeat Characters! Best dressed 'Heartbeat' character was Teressa Vincent who is the new 'Gina' of Aidensfield where she received a lot of attention from Lord Aidensfield (aka Dean Oakey) who tried to get his Lordship's way with poor innocent Gina; local hero and Mod scooter Hard Man (Aka Paul Vincent) ensured 'Gina' got safely home (Its dangerous on those Moors) !!!!! Our Journey on the final leg commenced at 8am gathering outside the Aidensfield Inn, the best collection of 1100s in North Yorkshire for sure. We made a superb specticale driving through the Yorkshire moors where John in his gorgeous MG 1100 3 door led the way and cleared the sheep! Our journey was incident free covering in excess of 200 miles in just over 4 hours! Jose Ambel and Claude Thomas even had time to go and wash their cars.......amazing guys! We assembled at Warwick Services for our mass arrival down the road to Gaydon were we received much attention from those passing through the services. Our collective entry into Gaydon was almost missed by the Chair of the 1100 Club who must have been counting the revenue receipts from all our petrol receipts!!!!!!!!! Nice one Chris even though we phoned ahead!!! It was an emotional feeling finishing our Epic LEJOG. Our cars have been fantastic with all those that started crossing the finishing line with pride and achievement. What has made this event is the people who have participated who have pushed themselves and their cars through a challenging Tour Assembly covering in excess of 1600 Miles. I am honoured to have formed such genuine friendships over the last week with some of the the best people I have ever travelled with; we are one, we are LEJOGers!!!!! Lastly thank you to you for following our progress and giving us your support throughout our tour, it has been greatly appreciated. Very finally a very big thank you to our Webmaster Phil in Australia who without his support and help and going way beyond the call of duty you would not have been able to follow our progress; Phil, a big thank you mate. - No worries, it has been a pleasure! Alexander Boucke's VDP suffered a Jammed starter motor whilst stopping at an attraction on the final leg. 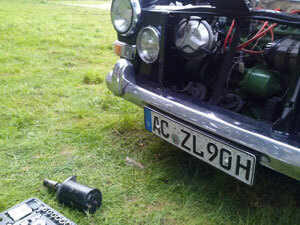 The VDP being an automatic he couldn't push start so out came the starter motor. He managed to make a DIY repair and was soon on his way. Now how many modern cars could you have done that with? ?